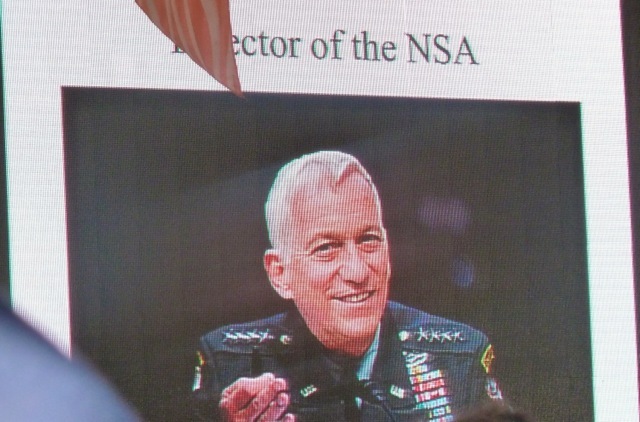 A slide presented by David Bradley of The Atlantic featured a spoof photo of Walter Isaacson as "Director of the NSA." The first “big idea” to be rolled at out at the ninth annual Aspen Ideas Festival, which started on the Aspen Institute campus Wednesday afternoon, is the notion of creating a national service program in America that would attract one million young people annually. The Institute has created a new policy program around the idea of giving Americans a way to serve their country for a year — for a modest stipend — without volunteering to join the military. McChrystal raised the idea of creating a national service campaign during last year’s Ideas Festival and has been working on the concept with the Institute since then. Service would not be mandatory, and it could include the military, but it would also include the Peace Corps, AmeriCorps or programs such as Teach for America. McChrystal echoed that theme, when he said that in the future “I kind of want the people who didn’t (serve) to look at the floor in embarrassment” when asked the question about their service. As the Ideas Festival unfolds its packed schedule through Tuesday, the idea of national service is likely to generate a lot of discussion, as will issues in the news, including recent Supreme Court decisions and the National Security Agency. David Bradley, chairman of Atlantic Media Company, gave his usual wry introduction to the Ideas Festival and joked that since the festival had been recently sold to the NSA, credentials would no longer be needed as drones with face-recognition software had been deployed above the Institute grounds. This morning, for example, Karl Rove of Fox News and formerly of the Bush administration is speaking at 9 a.m. on the future of the Republican party. The line-up of speakers and presenters at Ideas Fest — none of whom have been paid to appear according to festival organizer Kitty Boone — is typically impressive. Two Supreme Court justices — Stephen Breyer and Elena Kagan — will be at the festival, as will a bevy of bold-face names with Washington experience, including U.S. House Majority Leader Eric Cantor, Transportation Secretary Ray LaHood, and former House member Gabrielle Giffords. From the world of finance comes Goldman Sachs CEO Lloyd Blankfein, former Treasury Secretary Henry Paulson, and David Rubenstein, the co-CEO of the Carlyle Group. And David Brooks, Katie Couric, Tom Friedman, Ariana Huffington, Steve Inskeep and Andrea Mitchell will be in attendance from the media sector. In all, over 350 speakers, presenters and moderators are listed in the festival program guide, and almost every one has an interesting and impressive resume. Thankfully, Jeffrey Goldberg, a national correspondent of The Atlantic, is also on the list. An expert on the Middle East, Goldberg has in recent years at the Ideas Festival developed a knack for making sure the pretension level on the Aspen Institute campus doesn’t soar totally out of control. Wednesday, he stepped up during the big opening convocation and said one of his ideas was to start a campaign to convince America’s fruit growers to stop putting little stickers on every piece of fruit they sell.